Q: What do flamenco dancing, owls and cheese scones have in common? A: We did them as part of our activities programme in just two weeks in early January! Each month we have a varied programme of actives on offer for Fairfield residents to enjoy. Our activities coordinator Laura makes sure that there is something that interests everyone, from challenging our bodies to keep moving, our brains to stay sharp, to make us laugh, remember and inspire conversation. The first two weeks in January combined visits from owls and a flamenco dancer with a cookery class to make cheese scones! We always enjoy our visits from Al with his beautiful hand reared owls. Al gave us a very interesting talk about each of the owls he brought with him which inspired lots of questions. 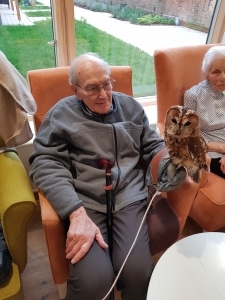 A number of residents made the most of the opportunity to hold an owl, for many this was the first time in their life they had been so close to an owl. We had to don the protective handling glove for the owl to sit on and it gave everyone a chance to see and stoke these amazing birds. Being in a residential care home means that many of us miss being able to bake and cook like we did at home. We enjoyed an afternoon making cheese scones in the activities room, which is equipped with a small kitchen for baking. We were able to have a go at measuring, stirring, mixing and then, best of all, we ate the scones straight from the oven – they were delicious! The flamenco dancing was truly marvellous and one of the best things that I’ve seen for a long time. Her outfit was beautiful. The highlight of the week was a performance by a flamenco dancer. This amazing dancer is a Flamenco teacher who originates from Spain, so in addition to showing us her incredible flamenco dancing skills, she also taught us how to say hello and goodbye in Spanish. Some of our residents had a go at dancing and others donned traditional Spanish hats and shawls as we learnt about flamenco dancing, the history and the traditions. The rest of the activities programme for January is just as exciting with book clubs, knitting groups, dance classes and flute and guitar recitals! You can check out our monthly programme of activities here.